Rhythmic Activities and Dance 2 Edition Rhythmic Activities and Dance, Second Edition, is a collection of some of the most popular recreational dance forms, geared for teachers of K-12 students and for recreation directors and leaders who want to teach easy rhythms and dances for fun and fitness. Significantly updated, expanded, and reorganized from the first edition, this second edition features the following:-A new chapter on social dance, focusing on basic rhythmic patterns and introductory steps to help students learn how to waltz, foxtrot, tango, merengue, salsa or mambo, rumba, and swing-Instructions for using cognitive, affective, and psychomotor objectives to assist in developing appropriate units for your students-An easy-to-use rhythmic activity finder to help you find dances and activities -A stronger focus on social development, including suggestions for setting up a nonthreatening environment and including students of all abilities-Assessment sections providing tips for having students create their own dances and a rubric to assess them, review questions, and observation questions-An accompanying CD that contains the music you need for teaching many of the dances and activities in the bookBased on standards from the National Dance Association, the National Association for Sport and Physical Education, and the North Carolina Standard Course of Study, this book is even more user friendly than its previous edition. The organization moves from easy rhythmic games and activities to specific dances, including line dances, folk dances, mixers, square dances, and social dances. You can select activities across chapters or develop units of instruction per chapter, depending on the interest levels and abilities of your students. The book also contains cross-references to companion music provided on the CD. 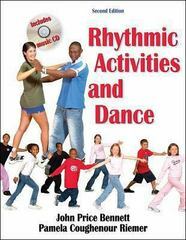 Having this CD means you will have music for many of the dances and lessons without expending extra funds, time, and effort to find appropriate music.Rhythmic Activities and Dance, Second Edition, is an essential resource for teachers, recreation directors, and recreation leaders looking to include all students and to encourage fit, joyful lifelong movers and learners. With its built-in progression, its wide array of selections, and its flexibility in shaping a dance program, you will not be out of step with this new edition.